Introduction: Self-expanding metallic stents (SEMS) are being used for “palliation” and as a “bridge” to surgery in obstructing colorectal disease. This approach may be associated with less morbidity and mortality than immediate operation for this surgical emergency. A laparoscopic approach is usually contraindicated due to bowel distention encountered in this acute situation. However, by relieving the obstruction with SEMS, laparoscopic colon resection becomes feasible in an elective setting. 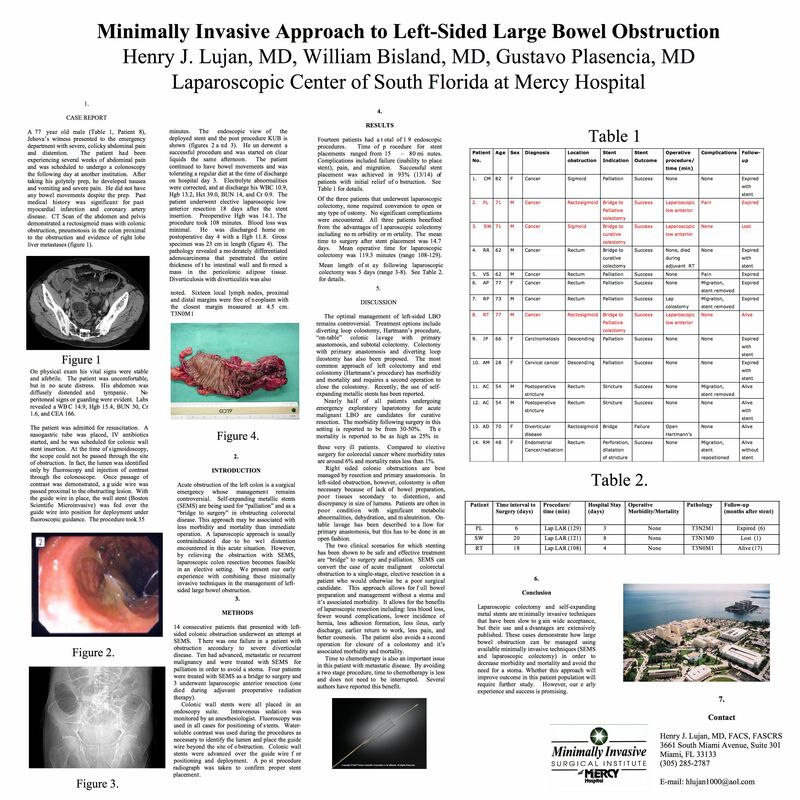 We present our early experience with combining these minimally invasive techniques in the management of left-sided large bowel obstruction. Methods: 14 consecutive patients that presented with left-sided colonic obstruction underwent an attempt at SEMS. Ten had advanced, metastatic or recurrent malignancy and were treated with SEMS for palliation in order to avoid a stoma. Three patients were treated with SEMS as a “bridge” to surgery and underwent laparoscopic anterior resection. Results: No significant complications occurred, specifically, no perforations. There was one failure in a patient with obstruction secondary to severe diverticular disease. Of the three patients that underwent laparoscopic colectomy, none required conversion to open. Conclusion: Laparoscopic colectomy and self-expanding metal stents are minimally invasive techniques that have been slow to gain wide acceptance, but their use and advantages are extensively published. These cases demonstrate how left-sided large bowel obstruction can be managed by combining two minimally invasive techniques and, thus, decrease morbidity and avoid the need for a stoma. Whether this approach will improve outcome in this patient population will require further study. However, our early experience and success is promising.